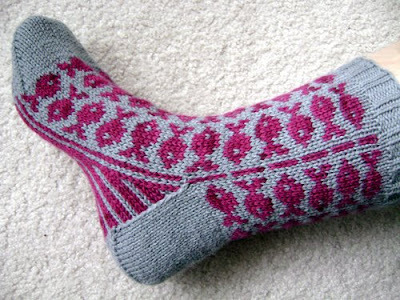 Looking forward to making the socks....will check back later today and again tomorrow see if they appear! March 7, 2009 at 10:13 a.m. Very cute and one I think I will have to buy. March 7, 2009 at 10:19 a.m. These are great! I just ordered the mitten pattern last week. Can't wait to add this! March 7, 2009 at 12:47 p.m.
March 7, 2009 at 12:50 p.m.
March 7, 2009 at 5:59 p.m.
March 7, 2009 at 6:38 p.m.
Those are just adorable. I love your color combination too! March 7, 2009 at 7:34 p.m.
Swedish Fish Socks -- catch and RELEASE!